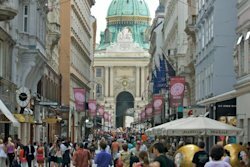 Austria's most populous city  Vienna  has won the title of the world's best city for quality of life since 2009. It is also one of eight European cities to make the top 10 list, showing the region's dominance in the survey. Vienna is the cultural, economic, and political center of the country. It has the highest per capita GDP among all Austrian cities at over $55,000. Vienna's ability to transform old infrastructure into modern dwellings won the city the 2010 United Nations urban planning award for improving the living conditions of its residents. Under a multimillion-dollar program, the city refurbished more than 5,000 buildings with nearly 250,000 apartments. Vienna is also the world's No. 1 destination for conferences, drawing five million tourists a year  equivalent to three tourists for every resident. The country's economy has, however, not been immune to the crisis plaguing Europe, and shrunk 0.1 percent in the third quarter of the year, as the European Union entered its second recession since 2009. Zurich, Switzerland's largest city, keeps the number two spot from last year after holding the title of the city with the best quality of life in the world previously. It is also one of three Swiss cities to make the top 10 rankings  tying with Germany for the most number of cities on the list. Known as a global financial center, one out of every nine jobs in Switzerland is based in Zurich. Its low tax rates attract overseas companies and the assets of the 82 banks based there are equivalent to more than 85 percent of the total value of assets held in Switzerland. The city is also the country's biggest tourist destination, famous for its lakeside location and chain of hills that run from north to south, providing an extensive range of leisure activities. The cost of living in Zurich is the sixth highest in the world, according to Mercer. Both Zurich and Geneva make Switzerland the most expensive country to live in in Western Europe. The city also attracts people to buy luxury properties here, because of its low taxes, safety record and good education system, according to real estate firm Knight Frank. New Zealand's largest and most populous city, Auckland, offers the best quality of life in the Asia-Pacific region, now for the second year in a row. It has been consistently placed within the top five best places to live in for the past six years. Auckland is uniquely set between two harbors, with 11 extinct volcanoes and numerous islands making it the city with the world's largest boat ownership per person. 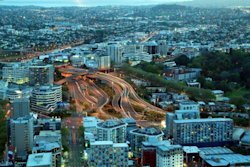 Auckland is New Zealand's economic powerhouse - its 1.4 million people account for more than 30 percent of the country's population and contribute 35 percent to the country's GDP. Auckland is also home to the most educated people in the country, with nearly 37 percent of its working population holding a bachelor's degree or higher. In March, the city launched a 30-year initiative called "The Auckland Plan" to make it the world's most livable city. The plan aims to tackle challenges in transport, housing, job creation and environment protection. However, the city has been impacted by the global economic slowdown. In the third quarter New Zealand's unemployment rate hit a 13-year high of 7.3 percent. Munich is Germany's third largest city and one of the country's key economic centers. It is also one of three German cities to dominate the top 10 rankings for the best quality of life. 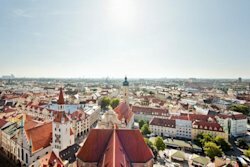 Holding on its fourth spot from last year, Munich is home to some of Germany's most notable businesses, including engineering firm Siemens and insurer Allianz. The city generates nearly 30 percent of the gross domestic product of the State of Bavaria. Munich's per capita purchasing power was more than $33,700 in 2011, the highest among all German cities and 30 percent above the national average. Drawing immigrants to its industries from all over the world, more than a fifth of the city's residents are foreigners. Munich ties fellow German city Frankfurt for having the second best infrastructure in the world, according to Mercer. In total, four German cities including Dusseldorf and Hamburg dominate the top 10 infrastructure rankings highlighting the country's first-class airports and high standard of public services. Vancouver is the only Canadian and North American city to make the top 10 list this year, similar to 2011. 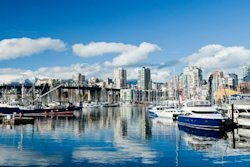 Vancouver has made it to a number of rankings on the world's most livable cities over the past decade and has been among the top five in the Mercer quality of living survey for the past six years. Home to one of the mildest climates in Canada, Vancouver is also its greenest city with the smallest carbon footprint of any major city in North America. Surrounded by water and snowy mountains, Vancouver's government constantly promotes green building, planning, and technology with the ambition of becoming the world's greenest city by 2020. In terms of infrastructure, Vancouver also tops the rankings for North America at ninth with Montreal and Atlanta landing in 13th place. Overall, Canadian cities still dominate the top of the rankings for North America despite only Vancouver making it into the global top 10. Ottawa comes in at 14, Toronto at 15 and Montreal at 23, while it's closet U.S. competitor is Honolulu at 28 globally.